Polish financier; agent of the Polish prime minister Count Brühl; born at Starokonstantinov, government of Volhynia, in the beginning of the eighteenth century; died probably between 1770 and 1780. His father's name was David ben Shachneh, his brother's name Shachneh, and according to his own statement (letter to Jacob Emden, September, 1758) he was a descendant of the celebrated rabbi Shalom Shachneh of Cracow, the founder of the yeshibah of Lublin, who died in 1558. He received an education far superior to that of the Polish Jews of his time. He was well versed in Talmudic literature; spoke and wrote Hebrew, Polish, German, and probably French. By his accomplishments and address he won the favor of the extravagant Count Brühl, who virtually ruled Poland in the reign of August III., 1733 to 1763. This enabled him to exert his influence at the Polish court and with the nobles (see Jacob Emden, "Torat ha-Kenaot") in behalf of his coreligionists, who at this time had to endure much at the hands of the Catholic clergy and the merchants. When the teachings of the pseudo-Messiah Shabbethai Ẓebi began to spread through South Russia, Baruch took an active part in the fight against them. In 1751, as may be seen from his letter to Aryeh Loeb of Amsterdam, he prosecuted the prominent members of the Shabbethaian sect, Abraham Ḥayyim (ben Ḥayyim) of Lublin, and his son Ḥayyim, the former being one of the directors ("parnas") of the Council of the Four Lands, which was then being held at Starokonstantinov. The wealthy and influential Abraham having the support of many rabbis and of the members of the council, Baruch had to use the influence of the secretary of the Polish treasury, Shidlinsky, who ordered Abraham's arrest, and censured the rabbis, pointing out the great danger which sectarianism might bring to the Jewish religion. He ordered them to obey Baruch Yavan, and to present to the next council his son Ḥayyim, who had taken to flight. Abraham sought to bribe Baruch Yavan to drop the case, but Baruch rejected his offer with 'contempt, and spent considerable money in the prosecution of the sectarians (see "Torat ha-Kenaot," pp. 123-127). When the zealous Bishop Dembowsky of Kamenetz-Podolsk, after a religious disputation which he had ordered to be held between the rabbis and the Frankists, or followers of Jacob Frank, the reckless apostle of Shabbethai Ẓebi, instructed his agents to seize copies of the Talmud and to bring them to Kamenetz-Podolsk, Baruch implored the aid of Count Brühl, who advised him to apply to the papal nuncio Nicholas Serra. Before instructions were received from Rome, thousands of copies of the Talmud were burned, and it is hard to say how far this persecution of the Jews would have been carried had not the zealous bishop suddenly died, November, 1757. On another occasion, when, owing to the machinations of the Frankists, the blood accusation was brought against the Jews, Baruch exerted all his energy to ward off danger from his hunted people, being one of the most prominent counsel before the nuncio, who reported the case to the pope (A. Kraushaar, "Frank i Frankisci Polscy," Cracow, 1895; Emden, "'Edut be-Ya'aẓob"). When Russia began to interfere more actively in Polish affairs, and Frank—who had been kept in prison—seeking, in January, 1768, to obtain his release by securing Russian influence in his favor, despatched his agents to Moscow armed with recommendations from influential persons in Warsaw, Baruch, who was informed as to Frank's movements, forestalled his emissaries. Baruch was then in St. Petersburg, where he enlightened the Polish representatives as well as those of the Russian authorities. From a letter written by Judah Loeb of Pinchov to Jacob Emden, it is evident that Baruch exercised considerable influence among the officials of St. Petersburg. The Jew Bima Speier of Mohilev, who had thorough command of the Russian language and was posted in all Russian affairs and in Russian history and literature, labored actively with him in exposing the Frankists (see Judah of Pinchov's letter in Emden's "Hitabḳut" and in Grätz's "Frank und die Frankisten," Supplement 7, pp. 33 et seq.). 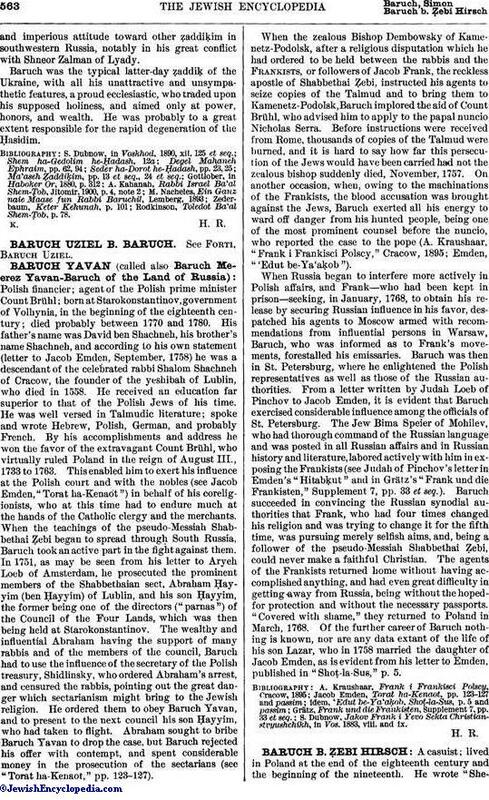 Baruch succeeded in convincing the Russian synodial authorities that Frank, who had four times changed his religion and was trying to change it for the fifth time, was pursuing merely selfish aims, and, being a follower of the pseudo-Messiah Shabbethai Ẓebi, could never make a faithful Christian. The agents of the Frankists returned home without having accomplished anything, and had even great difficulty in getting away from Russia, being without the hoped-for protection and without the necessary passports. "Covered with shame," they returned to Poland in March, 1768. Of the further career of Baruch nothing is known, nor are any data extant of the life of his son Lazar, who in 1758 married the daughter of Jacob Emden, as is evident from his letter to Emden, published in "Shoṭ-la-Sus," p. 5. S. Dubnow, Jakov Frank i Yevo Sekta Christianstvyushchikh, in Vos. 1883, viii. and ix.